Apr 26 Is Graphene Bulletproof? The properties of graphene have always seemed somewhat miraculous. As well as the high electrical and thermal conductivities due to the atomic lattice, graphene is incredibly strong. A layer of carbon a single atom thick that is somehow the strongest material in the world. If cling-film has the same strength as graphene (and was around 100 micrometres thick), it would require 20,000N of force applied over an area the size of a pencil nib to break through it. Part of this extraordinary strength stems from the strength of the carbon-carbon bond – but also in how the strengths of materials are typically determined. A material is only as strong as its weakest links: impurities or defects in the material are typically the factor that determines its overall strength. Given that graphene nanolayers are just a single atom thick, however, there really isn’t enough space for impurities or defects to weaken the material; tearing it or puncturing a hole in graphene requires putting in enough energy to break all of the relevant carbon-carbon covalent bonds, which is why graphene is so strong for its size. Given that graphene weighs next to nothing, and it has this extraordinary strength and flexibility, people have naturally considered the possibility that it might be used as body armor – or at least to augment existing body armor. Early examinations into graphene focused on its tensile strength – the fact that it can be pulled taught with tremendous force before snapping makes it useful for all kinds of engineering projects, from haulage to use in a space elevator. 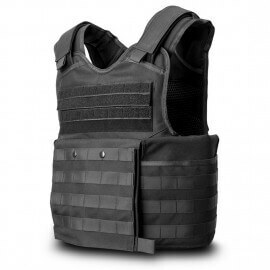 Yet its ability to resist impact would be key for any use in body armor. Is graphene bulletproof? A single layer of graphene would be destroyed by a bullet impact. For this reason, it has proved difficult to determine precisely how graphene responds to projectile impacts – all such tests are, by their nature, destructive. But scientists have got around this with a unique experimental setup – and their results are encouraging for the idea that graphene, in combination with other materials, could one day be used as lightweight body armor. The experiment, conducted by Jae-Hwang Lee at the University of Massachusetts-Amherst, used melting gold filaments to explosively propel a micrometre-scale glass bullet towards several layers of graphene. The experimenters were able to witness graphene’s deformation when the bullet impacted the layers. They found that the layer deformed inwards in a conical shape when hit by microbullets traveling at three kilometres per second – substantially higher than the speed of a bullet from an M16 rifle (albeit the microbullets are far smaller.) Following this, the material cracks radially outwards and ultimately disintegrates. Researchers from Rice University found that 300 layers of graphene – which is, after all, at most 100nm thick – were capable of stopping such microbullets entirely. Key for potential applications of graphene in body armor, though, was their ability to spread kinetic energy quickly and across a wide area. The deadly, penetrative quality of a bullet owes to the fact that its kinetic energy is overwhelmingly transferred to a very small impact area; the aim of body armor is to distribute the force across as large a region as possible. The high thermal conductivity of the graphene lattice means that it distributes kinetic energy quickly before fragmenting – sound waves travel three times faster through graphene than they do through steel, and this means it can withstand ten times the kinetic energy that steel can. Kevlar works in a similar manner – rather than stopping bullets, it aims to dissipate kinetic energy across a wide region, and slow down the bullets that do manage to penetrate it entirely. The graphene nanolayers performed twice as well as Kevlar, so it seems likely that they will be incorporated into new types of body-armor shortly – although the radial cracking of the material means that it can’t be reused after an initial impact. Efficient heat transfer in graphene could be used for aerospace purposes – for example, high-altitude aircraft and spacecraft could use composites with layers of graphene to efficiently transfer heat and allow them to re-enter the atmosphere without being damaged. Yet, as often seems to be the case, graphene could have even more to offer through as-yet unexplained properties. Scientists at the City University of New York have determined that two layers of graphene stacked together can become as hard as diamonds on impact due to interactions between the layers. This material, called diamene, is usually flexible like a foil – but becomes hard when sudden mechanical impacts are applied. The effect only works on di-layers of graphene (which are at the moment mounted on a silicon carbide base) – but it illustrates that graphene may still have surprises that could render it useful as a bulletproof material. Apr 24 What is Graphene?